The only way to learn how to create true Chicago-style pizza is to immerse yourself in it right at the source. Theo Reynolds, the founder of Pizz’a Chcago was born and bred in the Windy City and admits how his first taste of this pizza style changed his entire life. From his first taste to his first restaurant opening, he spent years learning the ins and outs of everything that makes Chicago-style pizza special so he could recreate it for his customers. Pizz’a Chicago cares about the environment and does everything they can to reduce their carbon footprint. They use unbleached paper products, recycle, and stock their restaurants with biodegradable utensils. They are also outfitting their restaurants with filtered water to reduce their dependence on plastic water bottles. When you eat at Pizz’a Chicago, you know you are doing your part for the environment as well. 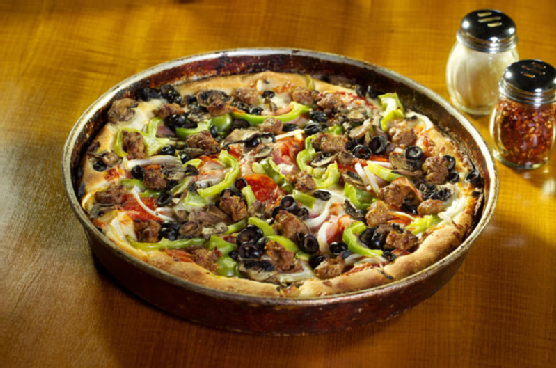 Pizz’a Chicago would be nothing without a menu full of delicious Chicago-style pizza and fresh extras that satisfy practically any craving. Start off with one of the tantalizing appetizers like garlic bread or calamari. Move on to your main course with one of the many signature pizzas, pastas, or calzones. If you still have any room left, you can sample one of the delectable desserts like cheesecake or the cookieza. Come to Pizz’a Chicago’s San Jose or Palo Alto location today to find out how we bring amazing pizza and the right kind of atmosphere to enhance your next dining experience. We promise to serve fresh, delicious pizza that makes you feel like you are actually in Chicago. For more information on our menu or locations, visit us online or call (408) 283-9400.